I am Marla Conrad from Middletown, Ohio. I have been in the singing Ministry for 37 yrs. now, singing southern Gospel music. I was raised in church and started singing as a child, standing in the seat next to my Mom as we traveled from State to State. My mother was a Missionary Evangelist which meant that I was on the road all through my childhood. I loved it then,and I love it now. "Train Up A Child". The calling was on my life and I realized that as a little girl. I was with a Quartet for 16 years but I felt God leading me in a different direction. I'm so glad I was open to the leading of the Holy Spirit. I took a "Step Of Faith" and started all over again on my own. God has opened so many doors and there has been so much more opportunity to worship Him the way I need to worship. My husband Wayne, and daughter Kiley Ann travel with me which has truly been a blessing.They are a very big support to me and I must say,"my biggest fans". They are also a very important part of this Ministry. The Lord has blessed me with a wonderful man that loves the Lord and is willing to pack up and go whenever and wherever the Lord would have us go. We were married on June 27, 1986. 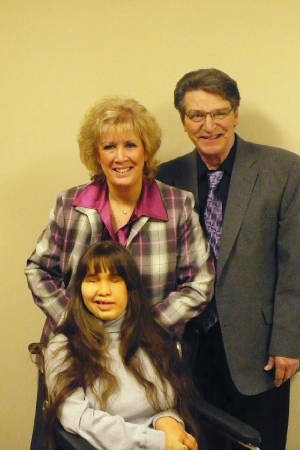 My daughter was born without eyes and is multi-handicapped, but I know the HEALER of blind eyes and crippled bodies. She is 31years old and loves the Lord, always thanking Him and praising Him for her healing. God is still in the miracle working business. I feel God has placed an anointing on my life and I'm so thankful for that. I never want to do anything that God doesn't have complete control of. Without the anointing it is just a performance and I never want to be found guilty of that. When asked as a child what I wanted to be when I grew up my answer was always the same. I wanted to be a Gospel singer and a Mommy. God has allowed me to be both. He is so good to me. I can't tell you that it has always been easy, because it hasn't been. Taking a blind, multi-handicapped child on the road for thirty one years is far from easy. But when you see the effect and impact she has on the people that we meet, you just have to smile and say, "Thank you Jesus, for giving this child to us". What a joy and blessing it is for us to be Kiley's parents. To be able to be together as a family and for me to Minister through song and testimony of the great and mighty things the Lord has done. Would I do it all again? ABSOLUTELY! I don't regret a single mile I've traveled for the Lord!